Here's an example of where vocals can be quite innovative and then subsequently make you wince. The album is obviously a concept album and in the vein of Ange, the vocals are theatrical often being the voice of many different characters. Aron Shade at time portrays what seems to be either an old or very sick man, and while creative, it can be difficult to listen to (especially with friends) when he gets excited and sings out of tune. The opening of the second side (of the LP) ("Ilusao Inacabada II") has some very nice more traditional Brazilian vocals, and there are other times where the vocals are more conventional. The music of this quintet is definitely in the Pink Floyd (or Camel) vein of relaxed and powerful symphonic rock. Enlisting Fabio Ribeiro on keyboards (very digital) gives the music a touch of the Emerson/Wakeman type of sound (with a couple more annoying fanfare type of synth runs). The music is often excellent, and III Milenio has come up with a lot of good ideas, but sometimes the vocals ruin the occasion (especially the horrible female vocals at the end of side two (of the LP)). Overall, its far better than most of what I've heard of the new Brazilian scene (e.g.- Tisaris, Dogma, Loch Ness, etc.) and is definitely worth a listen. Aliança dos Tempos is a reissue of the 1990 debut release by this marvelous Brazilian band. True to progressive rock, Aliança dos Tempos is a concept album telling the story, in Portuguese of course, about a young man Tawan who discovers freedom. The original release only covered the first act of this remarkable story. What makes this reissue so special is that III Milenio and Musea included, as a bonus, the 30 minutes of the recently recorded second act. 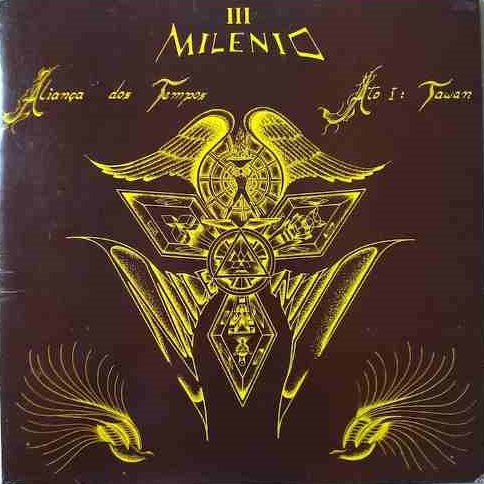 III Milenio’s music is a highly original symphonic rock that alternates between gentle and violent passages. If I understood Portuguese I might have a better grasp of why their vocalist sometimes sings with a guttural hoarse voice. Aliança dos Tempos is a joy to experience! The keyboards and guitars are sometimes grandiose in the manner of Rick Wakeman’s Journey to the Center of the Earth but they do not detract from the elaborate melodic and harmonic content of this disk. In addition to Musea’s normal extensive band history they introduced a new feature, a mini poster collage of band photos and English lyrics. Just like the Beatles White Album! This CD is a “must have” and is an outstanding example of contemporary Latin American progressive rock.